Earn a Certified Software Quality Professional badge, and stand out from everyone else! An IT Professional with certifications on his field of expertise guarantees job acceptance by top companies. Be it in Software Development, Project Management or System Administration–higher salaries await certified individuals! Earning a certification on Software Quality will give you an edge over everyone else. No matter what industry you are, or what IT expertise you have, all of them need Quality! An organization striving for Quality ensures great products and services, less defects, and excellent customer satisfaction! If you think Software Quality is only about Software Testing… think again! Quality should not be an afterthought of developing software. It must be embedded not only in an organization’s processes; it must be part of a person’s way of life! We can help you become a Quality Expert, and Stand Out From The Rest! DigiLEAF Inc., in partnership with the International Alliance of Quality Professionals, offers Certified Software Quality Professional courses and examinations to interested participants. Getting a certification on Software Quality allows you to apply industry-proven Quality principles and standards. Whether you are a Developer, Tester or even a Manager… you can be excellent by applying these principles! What Makes Certified Software Quality Professional Different From Other Certifications? What makes our program different from other Quality certifications (like ISTQB or ASQ), is that we help you become a well-groomed Quality Professional. Not just Software Testing, but from Process and Product Planning, to Software Development, and even Test Automation and Project Management. At DigiLEAF, we believe that Quality is everyone’s responsibility… so Inquire Now and know more about our Certified Software Quality Professional program! We only offer limited slots to ensure that participants can get the most of our training programs through our extensive workshops… so inquire now! 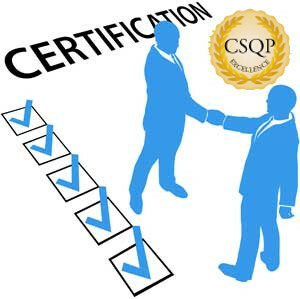 Public-run CSQP courses runs from June 25 to August 3, 2018! We also offer In-house and Customized CSQP programs for companies! Call us at (2) 551-2541, e-mail us at sales@digileaf.com, or visit this link to know more! You can also use the form below to request for information! previous post: Be Compliant with Software Quality Models and Standards!